THE PAINTER EDWARD HOPPER, ONE OF THE GREATEST CHRONICLERS OF THE ALIENATION OF MAN FROM HIS ENVIRONMENT, would have made an amazing street photographer. That he captured the essential loneliness of modern life with invented or arranged scenes makes his pictures no less real than if he had happened upon them naturally, armed with a camera. In fact, his work has been a stronger influence on my approach to making images of people than many actual photographers. “Maybe I am not very human”, Hopper remarked, “what I wanted to do was to paint sunlight on the side of a house.” Indeed, many of his canvasses fairly glow with eerily golden colors, but, meanwhile, the interiors within which his actors reside could be defined by deep shadows, stark furnishings, and lost individuals who gaze out of windows at….what? The cities in his paintings are wide open, but his subjects invariably seem like prisoners. They are sealed in, sequestered away from each other, locked by little walls apart from every other little wall. Marking Time, 2014. 1/125 sec., F/5.6, ISO 100, 35mm. I occasionally see arrangements of people that suggest Hopper’s world to me. 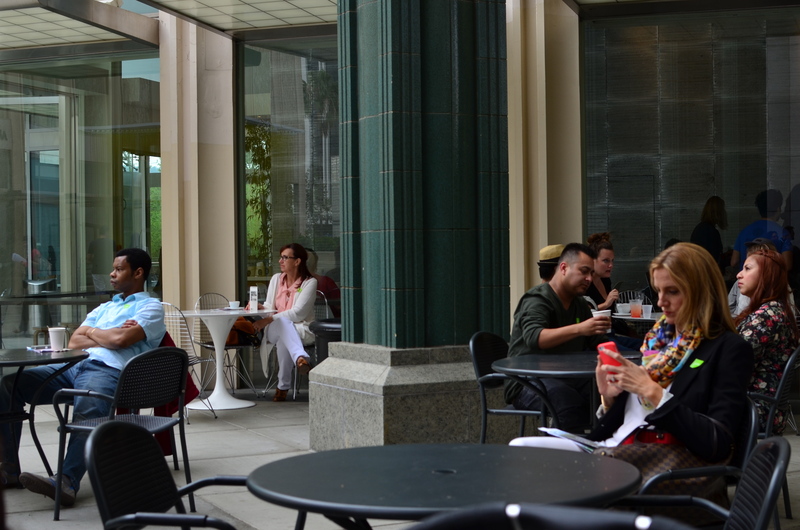 Recently, I was spending the day at an art museum which features a large food court. The area is open, breathable, inviting, and nothing like the group of people in the above image. For some reason, in this place, at this moment, this distinct group of people appear as a complete universe unto themselves, separate from the whole rest of humanity, related to each other not because they know each other but because they are such absolute strangers to each other, and maybe to themselves. I don’t understand why their world drew my eye. I only knew that I could not resist making a picture of this world, and I hoped I could transmit something of what I was seeing and feeling. I don’t know if I got there, but it was a journey worth taking. 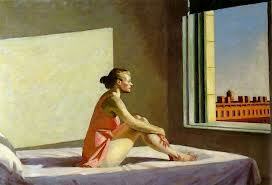 I started out, like Hopper, merely chasing the light, but lingered, to try to articulate something very different. Or as Hopper himself said, “It you could say it in words, there would be no reason to paint”. This entry was posted on May 31, 2014 by Michael Perkins. It was filed under Available Light, Candid, Composition, Conception, Environment, Framing, Perspective and was tagged with Composition, crowds, light, Painting, Viewpoint.